A former chief of staff to Rod R. Blagojevich, the ousted former governor of Illinois, pleaded guilty on Wednesday to wire fraud, describing in a court document how Mr. Blagojevich had pondered ways he might make money from his official role last year picking a replacement for Barack Obama in the United States Senate. Mr. Harris pleaded guilty to one count of wire fraud, and he pledged cooporation with prosecutors in exchange for a lighter sentence if convicted. Mr. Blagojevich is charged with 16 counts of corruption including racketeering conspiracy, wire fraud, extortion conspiracy, attempted extortion, and making false statements to federal agents. He has insisted he is innocent of all charges. The former chief of staff for ousted Illinois Governor Rod Blagojevich pleaded guilty on Wednesday and agreed to testify about attempts to cash in on the governor's power to fill a vacant U.S. Senate post. 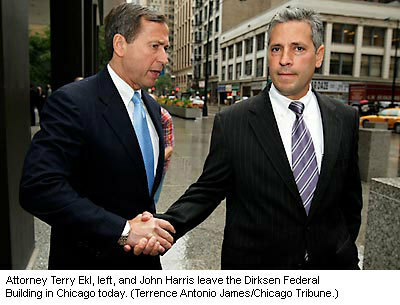 John Harris, 47, became the first of six defendants indicted in the corruption case against Blagojevich to reach a plea agreement with prosecutors. A trial is scheduled for June.